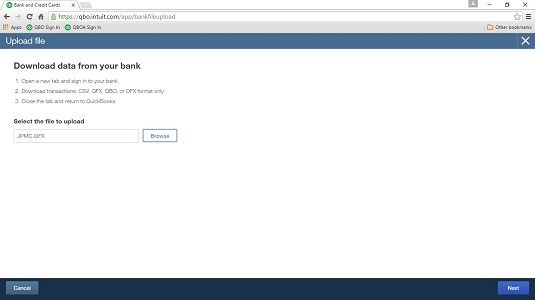 If you can’t connect your account directly to QuickBooks Online, perhaps because your financial institution doesn’t yet support QBO, you’re not out of luck. Instead, you can use QuickBooks Web Connect, which has been around for years. If you were previously a QuickBooks desktop user, you might have used QuickBooks Web Connect. When you use QuickBooks Web Connect, you download transactions from your financial institution’s website to your computer, and then you upload the downloaded transactions from your computer to QBO. Because QuickBooks Web Connect files are not encrypted, you should not use a public computer to download information using QuickBooks Web Connect. Log in to your financial institution’s website and look for a link that enables you to download to QuickBooks. Some banks have a “Download to QuickBooks” link. If you can’t find the link, contact your financial institution and let them direct you to the link. After you find it, make note of where it appears on your financial institution’s website for future use. If you save your file to some other format, QBO won’t be able to upload it. Select the dates for the transactions you want to download. If you download transactions with dates that precede the opening balance you entered for the account in QBO, the account’s opening balance will change. Save the file to a location on your computer where you’ll be able to find it later. Many people download to the Downloads folder or to their Windows desktop. To upload the file to QBO, log in to QBO and, in the Navigation bar, choose Transactions → Banking. At the right side of the page, click the arrow beside the Update button and choose File Upload. QBO starts the Upload Bank File wizard. Click the Browse button, navigate to the location where you saved the transactions you downloaded in Step 2, and select the downloaded file. QBO displays a screen where you select the QBO account into which you want to upload the transactions. Select the QBO account where the transactions should appear and click Next. When you see the confirmation screen, click Finish. Use this screen to navigate to the transactions you download from your financial institution. After you successfully upload a QuickBooks Web Connect file, you should delete it because it is not encrypted and it contains your account information.